Anesthetic agent spills not only waste expensive anesthetic agents; they also pollute the O.R. environment. Anti-Spil is designed to stop agent spills before they occur. 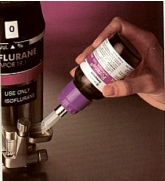 Simply attach the Anti-Spil adapter to the top of the anesthetic agent bottle and pour. 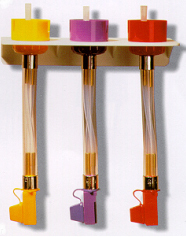 The metered valve controls the flow rate while the spout ensures that the agent goes into the vaporizer's funnel. 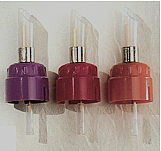 Each adapter can be re-capped after each use to prevent vaporization and pollution. Anti-Spil™ is color coded and reusable. VapofilL™ allows for rapid filling of your vaporizer without the annoying airlocks and slow drip of your old keyed adapters. A flexible outer sleeve coupled with a brass reinforced inner sleeve make the VapofilL™ more durable and less likely to break at the pressure points.